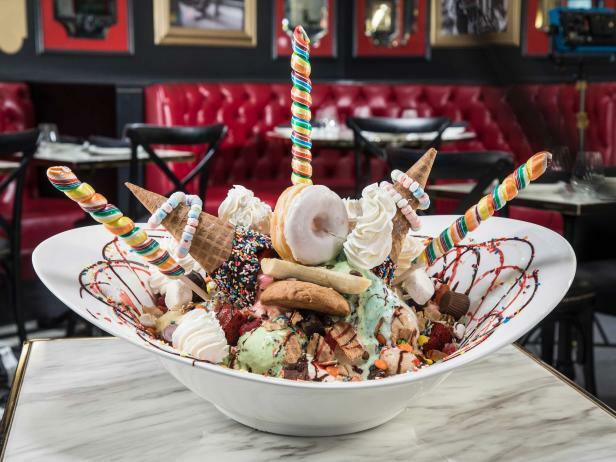 Made with 24 scoops of ice cream, this sundae--which serves 12 people--is the ultimate ice cream lover’s dream. It is covered with hot fudge, caramel and strawberry sauce, sliced bananas, toasted marshmallows, Reese’s Pieces, chocolate chip cookies, crushed waffle cones, gummi bears, white chocolate strawberry shavings, and toasted walnuts. Oh, and it also has whipped cream, giant lollipops, and sparklers on top. Although this restaurant has a variety of what they call “crazy shakes,” this one is the wildest by far. The cake batter shake has a vanilla frosted rim with rainbow sprinkles, topped with a funfetti cake slice, whipped cream, rainbow sprinkles, and a cherry. No wonder they only have a limited quantity per day! The vibrant purple-colored ice cream is due to its ube purple yam flavor (trust me, it tastes way better than it sounds)! The treat is also topped with fruity pebbles and marshmallows. Feeling extra special? You can place our treat in either a black chocolate or red classic cone. 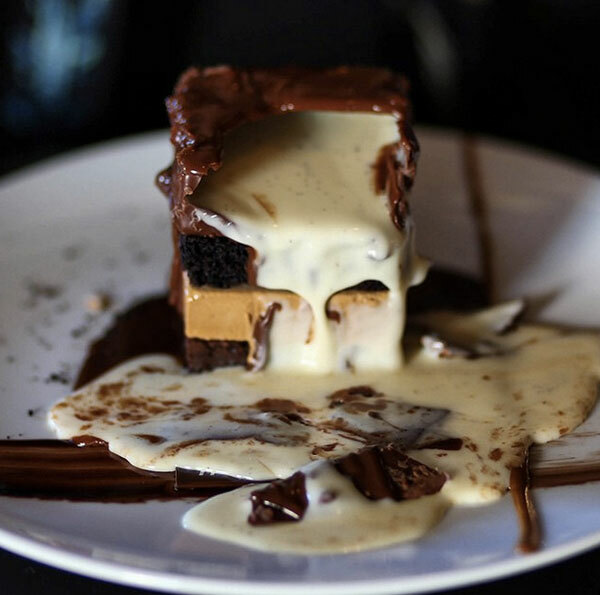 Chocolate lovers rejoice with this four-level tower made out of liquid “Klondike,” roasted white chocolate ice cream, a brownie, and Devil’s Food cake. The best part: when you hit the top layer with your spoon, it oozes melted chocolate. Adios, old-fashioned crunchy cones. Taiyaki’s fish-shaped Japanese waffle cone is your newest obsession. It’s chewy on the inside and crispy on the outside, blending perfectly with their delicious matcha soft serve. For a limited time, the store will also be serving a strawberry-vanilla swirl in a unicorn shaped cone! Classic rainbow-layered cakes have been taken to a whole other level. When you cut into Flour Shop’s vanilla-frosted concoction, it explodes rainbow sprinkles! The cake also comes in three different sizes--mini, midi, and maxi--so that you can buy a personal cake or one to share with friends! Don’t get me wrong, each flavor of this sweet shop’s edible cookie dough is unique and delectable in their own way, but there’s something special about this specific flavor. Dō’s take on the classic s’more mixes toasted mini marshmallows, crushed Hershey bars, and crumbled graham crackers with signature chocolate chip cookie dough. You can either eat your dough out of a wafer cone or mix it into an ice cream sundae! Every innovative dessert menu needs a classic. Serendipity has become a household name, all thanks to its extraordinary frozen hot chocolate. The dessert-drink, topped with a mountain of whipped cream and chocolate shavings, is the perfect cheat day treat. When this dessert is rolled to your table, initially, it looks like a mountain of cotton candy. But once the waiter lights it on fire, it melts down to reveal a delicious Baked Alaska underneath. 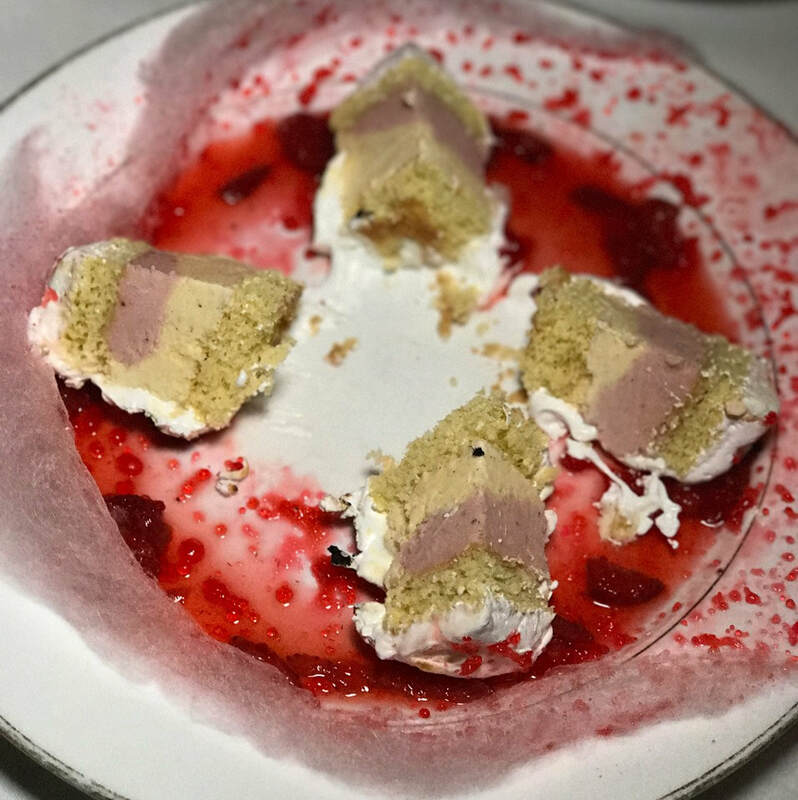 The dessert is made with strawberry and vanilla bean ice cream (to match the color of the cotton candy) and is surrounded by roasted strawberries. Pink, pretty, and perfect! The bakery does a sweet take on a classic croissant by producing them in traditional cake flavors and stuffing them with custard. 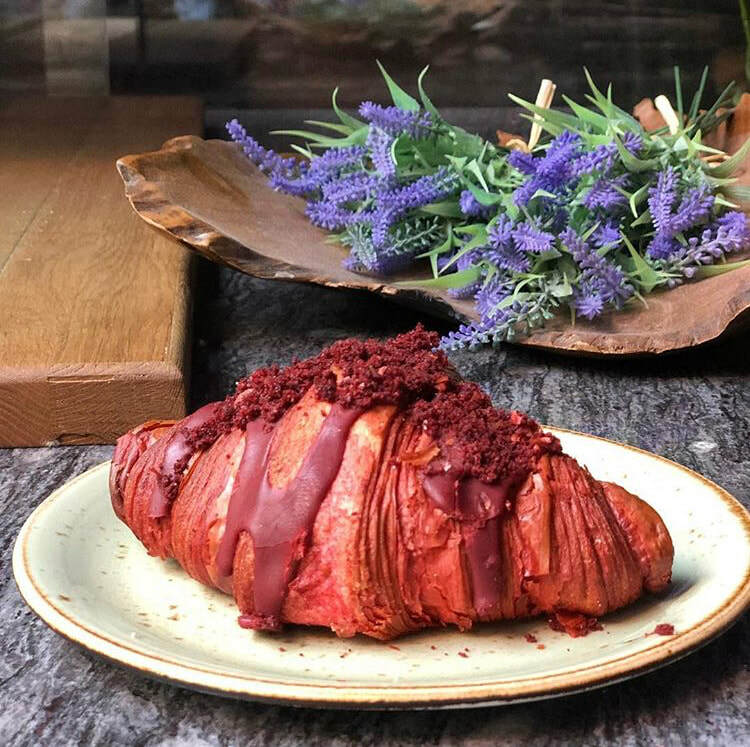 Although the bakery’s other flavors of croissants are delicious (birthday cake, matcha green tea, creme brulee, cookies n’ cream), the red velvet one is the most notable. The treat is stuffed with cream cheese custard and topped with red velvet icing and cake crumbles. Feel free to indulge for breakfast too, since it’s still a croissant after all. Pizza for dessert? Heck yes! The slices are decorated with melted milk and white chocolate chunks, and customers are given choice of two toppings: crunchy hazelnut bits, bananas, peanut butter, or roasted marshmallows. You can even order your pizza all the toppings listed above for some extra cash...because why not? Don’t worry if you’re not of age...this is actually a shot of cold-infused Tahitian vanilla milk served in an edible chocolate chip cookie “glass.” Before you run over there this second, remember that they only serve the treat after 3 pm! This bakery is whipping up innovative desserts like crazy! 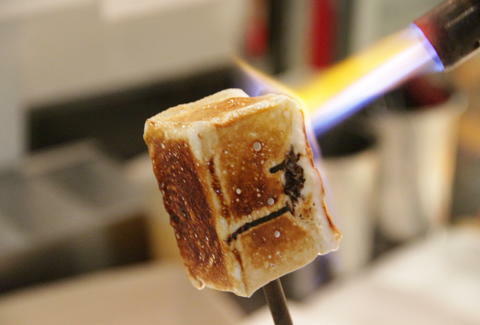 Their interesting take on s’mores they create is a frozen marshmallow wrapped around Tahitian vanilla ice cream with chocolate wafer crisps. It’s even served on a smoked willow wood branch and torched to order! That way, you can bring campfire vibes to the city year round. You’ve seen Kim Kardashian everywhere from the television screen to iPhones apps to book covers. Now she’s made her way onto one of America’s favorite desserts: the cookie. However, this large (7’’ by 7’’) sugar cookie--hand-decorated with royal icing--depicts Kim with tears pouring out of her eyes, inspired by her famous crying meme.